I often talk to my clients about non-judgment: the idea that you are in a situation where all you need to do is observe. You do not need to declare something right or wrong. You don’t have to fix anything, or argue your point of view. You simply observe, stay open, and trust that those in a particular situation have chosen to be there for some point of learning. I believe that Spirit deals with us in the same way. I long ago gave up the idea of this bearded fellow on a big throne who, like Santa Claus with a lightning bolt, watched to see if we were good or bad in every and any situation, and either blessed us or punished us. 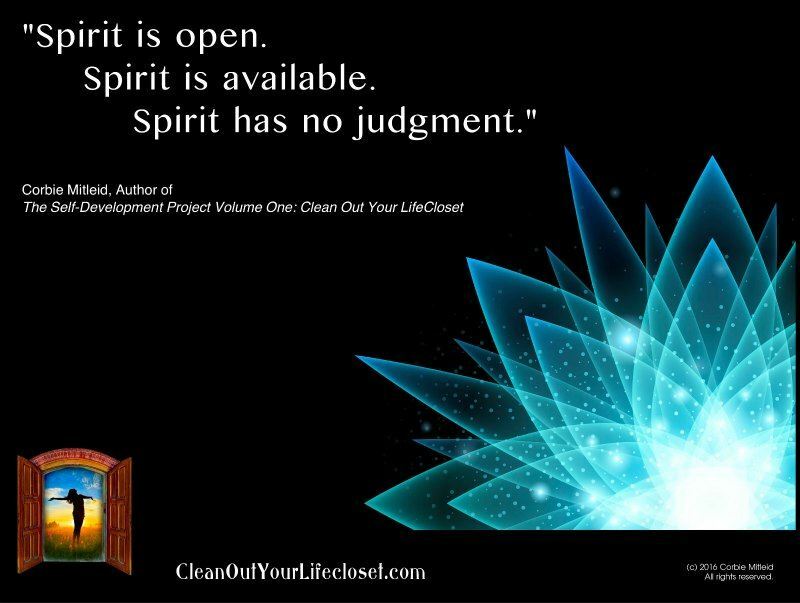 Spirit, for me, is a point of silence inside, a nonjudgmental cavern of peace. Judgment v. non-judgment is also headspace v. heartspace. Our head speaks to us of logic—a cause-and-effect, tab-A-into-slot-B sort of existence. We demand answers. We need to understand everything. The more we try to figure something out, the less objective we are. Judgments, expectations, and assumptions all crowd in—arguing with and elbowing one another—and making no room for the tranquil space of Spirit that sits in a corner, watching and waiting for things to settle down. Headspace v. heartspace also means that while religious texts of any flavor may help you understand your particular slant on the Source, it may not give you clarity of Spirit. All of these writings are somehow filtered through another human mind. As one of my fellow intuitives says, “Religious rules and strictures are someone’s ego telling us what to do. Clarity of Spirit is the ability to see through the smoke and mirrors to pure essence.” I agree. The Divine, the Source, presents Itself when we seek It from within. The Divine doesn’t follow man-made rule books. It doesn’t say “Yes” to Vijay and “No” to Maria and “Not yet” to Ahmed because of how they seek the One. As my own guide, Baruchiel, has explained it: You will find clarity of Spirit when you acknowledge, accept and rejoice in the fact that you are not your body, not your mind, not your experiences. You are and always have been part of the Ineffable Whole—unceasing, unchanging, non-judging. When you feel in balance and complete, when you feel that you are One with All That Is, there is clarity of Spirit. When you go inside and seek Spirit, there is no right or wrong way, no right or wrong answer. It is the quieting of your human existence, and allowing something far more universal to come and sit with you. The incessant mental chatter silences itself, and you can get in touch with Spirit: undying, eternal, compassionate.